For the benefit of those who have not read my previous post regarding my Sentosa night experience, I freaked out in the cable car and skyride. I've fear of heights and those rides, especially the skyride, really scared me out of my wits. So as we make our way to the Singapore Flyer, I'm asking myself "am I ready to face my fear of heights yet again thru another ride"? And my answer? Yes! Because I wouldn't let my fears dictate or limit my adventures in SG. I don't know if I could ever set foot again in this country so better to experience everything I could while I'm still here. 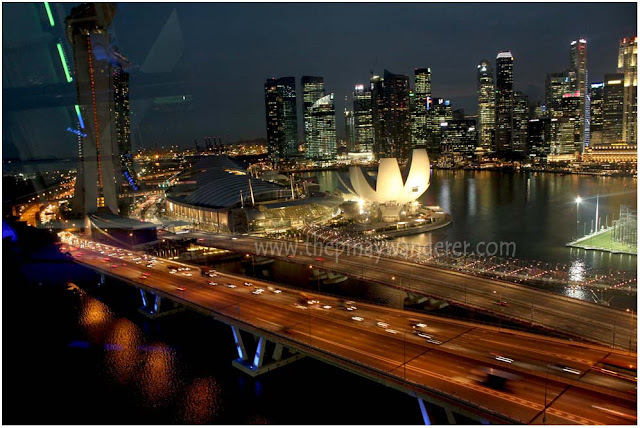 And so, after one whole day of exhilarating and fun-filled adventures in Universal Studios, we hurried our way to Raffles Avenue for the Singapore Flyer experience. 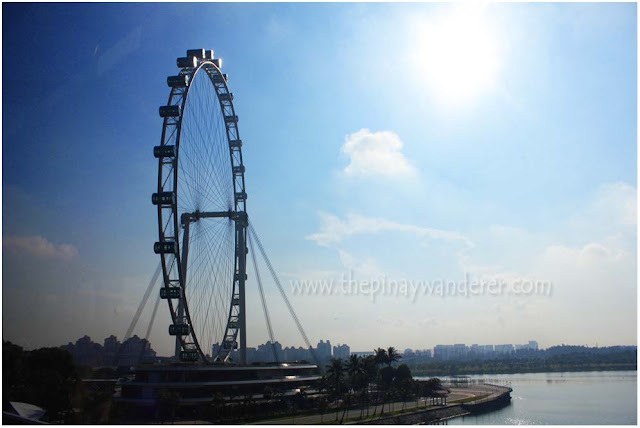 Singapore Flyer, a giant ferris wheel located in Raffles Avenue is another one of the famous attractions of Singapore. 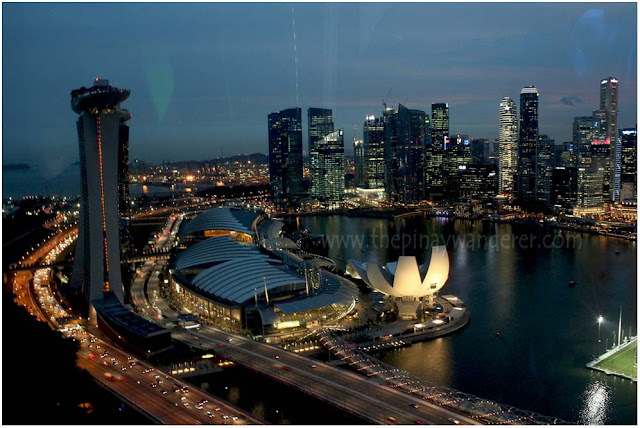 Standing at the height of 165 meters (equivalent to 42 stories high building), Singapore Flyer is the world's highest observation wheel. It's already past 7PM when we reach the SG Flyer so we immediately bought our tickets (SGD29.50 per person) and hurried our way to the boarding platform (last boarding time is 7:30PM). 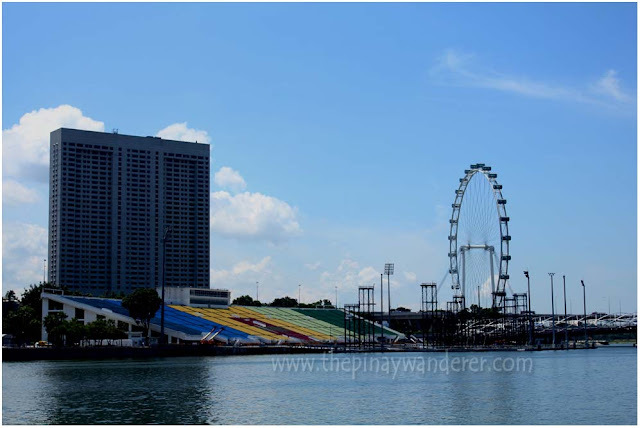 Unlike my experience with cable car and skyride, a ride to SG Flyer is a very relaxing and enjoyable experience. Although at first I still felt a bit scared; the capsule's flooring is a transparent glass I can see thru it. And when I looked down, it felt like I'm floating in the air. Nevertheless, I was still able to enjoy this ride as I feel safer in it. The Flyer's capsule is very stable even when we walk around it; we didn't feel any movement whatsoever. If not for the changing views as the giant wheel turns around, we wouldn't know that we are moving or turning at all. Nung bata ako takot din ako sa heights pero ngayon kahit nalulula pa rin hindi na masyado. Tama nga naman na kapag pumunta ka sa isang lugar, gawin mo na ang mga pwede mong gawin kasi walang makakapagsabi na makakabalik ka pa.
sige Ate Tal, sisikapin kong mag-aral ng mabuti para naman mapuntahan ko rin ang mga ganyang lugar! Ingat din po kayo parati! Wish ko lang din ma overcome ko ang fear of heights ko! Ma try nga muna ang MOA eye ferris wheel! hihi! wow! What a view! Love the pictures! 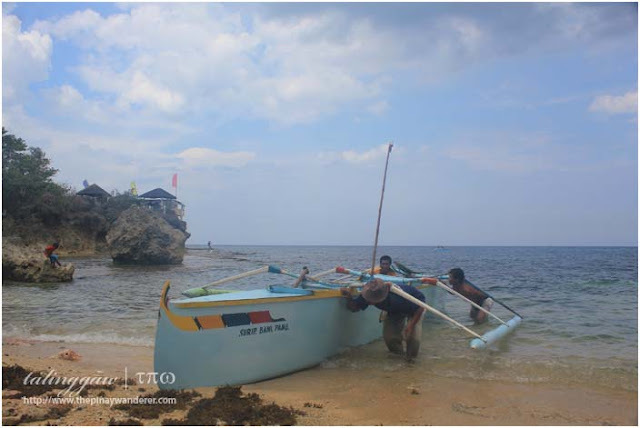 Di rin naman ako nakapunta eh, pic lang yan from the flyer. At saka parang di pa tapos yun buong garden, parang on-going pa yun constructions eh. Very good naman at na-enjoy mo ang flyer. Di naman kasi nakakatakot, lalo na dahan-dahan lang yung ikot niya. At saka, naka-enclose ka naman ;) Ganda naman ng pics! Anong lahi yung nagtanong kung san yung Malaysia? 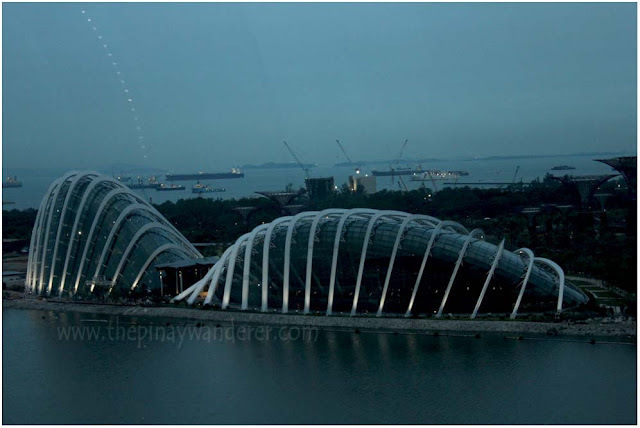 Parang nauuso talaga yung mga ferris wheel tulad yung sa London no, sabagay ang galing kasing magview ng isang lugar pag nakasakay ka sa ferris wheel. manalo lang ako ng lotto puntahan ko ang mga lugar na iyan,hehe..
Breathtaking is the exact word to describe the view.. ang ganda! Your shots are great! Not very good ka pa dyan, haha! And I love your attitude.. ganun dapat, di tayo nagpapatalo sa fears! Wow! 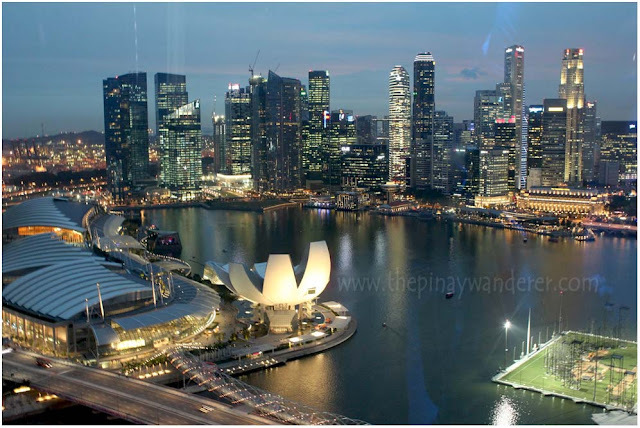 ang ganda ng mga photos mo girl..Superb, and very inviting to your readers that we need to visit the Singapore. 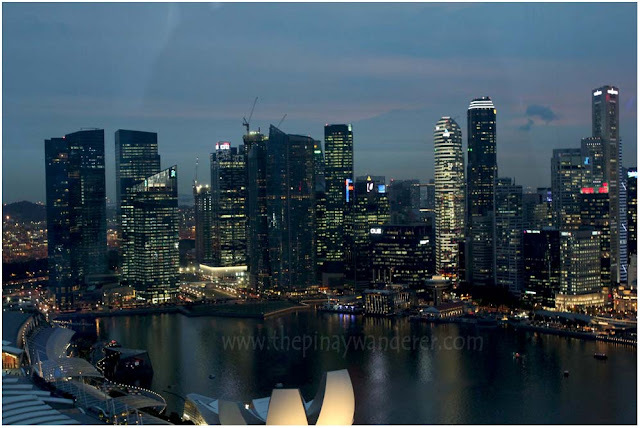 Very breathtaking shots, mahirap nga kumuha ng night shots + moving pa but u did well girl :) I heart SG na talaga! Naks, naka long exposure na, naka-blue hour photog pa hehe. Cool shots! Singapore is a dream..